An excellent day organised by Match Manager [and umpire] Geoff Birkett. Thanks go to Geoff, the umpire Steve Wood and the team captains Alastair Robinson [Robo’s Relics] and Steve Crute [Crute’s Crusader’s]. The first Slazenger’s day was in 2015 and the memorable moment was the gift of rhubarb offered by Geoff and Jane to the ladies. 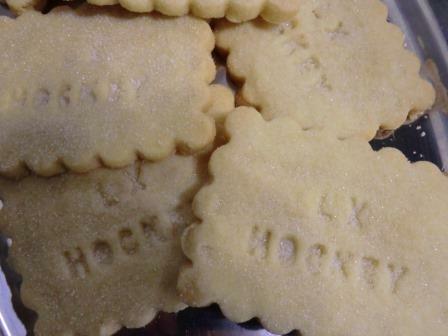 The same was a key part this year for another game in Yorkshire’s rhubarb triangle, but there was the addition of named LX CLUB shortbread with the coffee before the game. Thanks to the baker Diane Durrans. 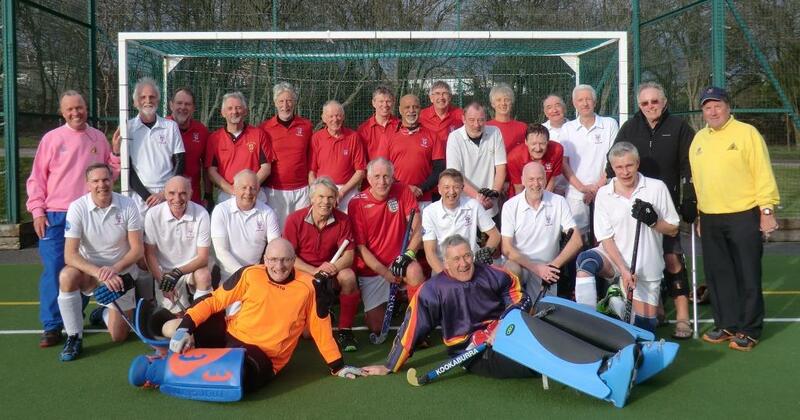 Despite the snow on large stretches of the Pennines, LX enjoyed a bright, dry afternoon of hockey. The "Reds" (Crusaders) were very quickly on the attack and a driving run into the circle by Trevor Denison resulted in a goal within thirty seconds from Tony Taig. This shocked the "Whites" (Relics) into action lest they lived up to their name and they gradually fought their way back into the game. In the second quarter of an evenly contested match "Whites" equalised after excellent work down the right created space for Nick Kennerly to weave his way around a number of the Reds defenders and score a good goal. The Relics had repeatedly out flanked the Crusaders who changed their battle plan for the second half reverting to a more traditional playing pattern and team formation. The 3rd and 4th quarters were dominated by "Red" pressure and determined "White" defence. After a series of short corners Stuart Forrest scored a deserved second goal for the "Reds", cunningly disguising a pass to the far post as a shot on goal. However the "Whites" were not prepared to concede and quickly equalised, again after excellent work down the right. After drawing the keeper off his line a pass across the circle found "guest" Graham Small unmarked in front of an empty net and he scored to create a score of 2 - 2! In the final seconds of the game "Whites" forced a short corner but in the true spirit of LX hockey they resisted executing the "finishing off" their opponents! The “Reds” did not find the Holy Grail of a victory but it was an improved result from the previous year’s campaign. As always, Paul Dallas covered every synthetic fibre on the pitch and guests Peter Reid, Mike Couttie and “rhubarb man of the match” Kevin White all gave excellent displays. The "Whites" owed much to the tireless work of their midfield, particularly Nick Kennerly and defenders Tony Neeve and John Ridings. Huge thanks go to Geoff Birkett for his organisation and umpiring, the ladies who provided great support and the hosting skills of the Slazenger’s club. It was a real pleasure for the LXers to welcome David and Jackie Ewing to Slazenger’s and to see them in such good spirits. Crute’s Crusaders in Red: Roger Parr [Gk], Steve Crute [Captain], Stuart Forrest, Peter Reid [Guest],Peter Danson, Trevor Denison, Kevin White [Guest], Rob Oakley, Sarbjit Dehl, Tony Taig, Mike Couttie [Guest]. Match Reporter: Alastair Robertson with additions from Steve Crute.